Salt Lake City, UT – Each year, avalanches claim more than 150 lives worldwide, and many more are caught in the “White Death” but survive. In recent years, these numbers have been increasing due to the boom in outdoor recreation. Skiers, snowboarders, hikers and other backcountry recreationists are drawn to the mountains, where they can potentially trigger avalanches as they cross hazardous terrain. Most of these avalanches occur from December to April, and it is imperative that these outdoor enthusiasts to be equipped with the proper gear to help increase the odds of surviving an avalanche, and the knowledge of how to use it. 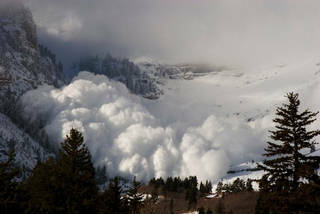 On average, each year avalanches claim the lives of more than 150 backcountry travelers worldwide. Yell – call out for attention! Try to quickly exit to the side or flank of the avalanche. If you can’t get off, fight to get to the rear of the avalanche where there is less turbulence. Grab trees rocks or what ever you can to get out. Kick, swim, and fight to stay on the surface. If caught in the turbulent flow of the avalanche, curl into a ball, protect your face. As the avalanche begins to slow, it will come to a stop quickly. Be prepared to push a hand toward the surface and attempt to make an air pocket in front of your face. Relax and hope your partner knows how to use the beacon, shovel and probe. Take charge and assign a leader. Take a head count and find out who is missing. Assess safety of the party – are there any other potential hazards that could occur during your rescue such as another avalanche? Turn your transceivers to search mode. Identify the “last seen point” for the victim and determine the search areas based on that. Begin a systematic search – Single searchers create a “zig zag” search pattern; multiple searchers line up in a horizontal line across the mountain, and search straight downhill. Locate the victim with a probe (gently), when you find the victim, do not remove the probe. Determine the depth and size of the hole required and start digging (hard and fast!) downhill and away from the probe, working your way toward the probe.